Yusif Eyvazov was expected but broke his foot. This was an excellent introduction to Tamara. Unfortunately for Kristine there were two other sopranos on the program known for this aria. New York Choral Society. Tamara was excellent in this, too. 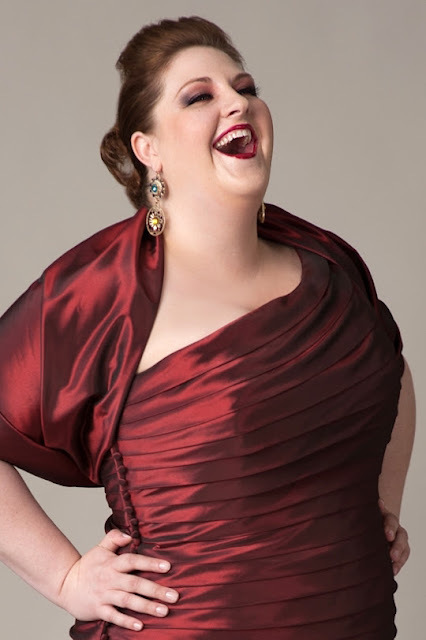 Jamie Barton, mezzo-soprano. For me this was one of the highlights of the evening, sung in a wonderfully smooth legato. Two Rossini tenors in competition. I think it was a tie. Netrebko was in form and remembered to thank first the cellist and then the violinist for their solos. She received a bouquet and then left. This was particularly and surprisingly beautiful. I liked Nadine and Javier in this. The concert lasted 2-1/2 hours. I skipped another concert for this and found that it was worth it. This is a slightly lighter mix of arias than is usual for a Richard Tucker Gala. There was no intermission. You can watch this now on medici.tv. The Makropulos Case by Leoš Janáček was presented last night at the San Francisco Opera. It is interesting to note that this opera made its American premier in 1966 in San Francisco. I think this opera doesn't quite work. Perhaps it works when you are seeing it for the first time and don't know what will happen. 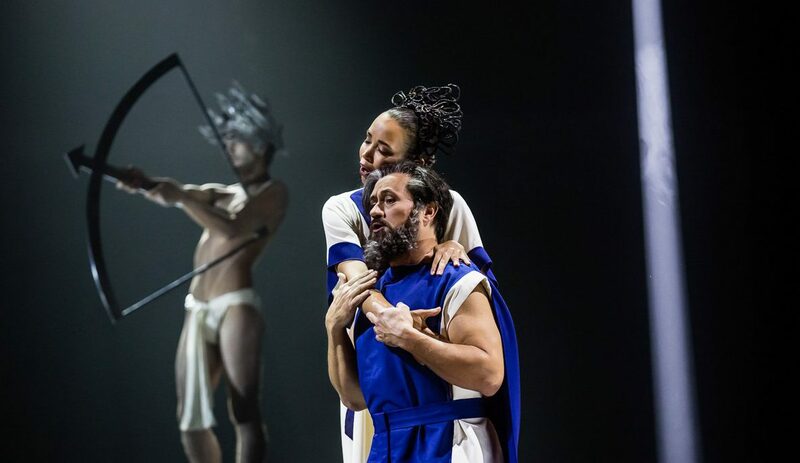 For most of the opera it seems to be about a lawsuit between Albert Gregor and Baron Jaroslav Prus over the estate of "Pepi" Prus, a lawsuit that has been going on for at least 100 years. It sounds like a Dickens novel. One side of the lawsuit, Albert, has a rumor saying Pepi promised the estate to his ancestor, while the other side, Baron Prus, is a distant relative of Pepi. The opera is actually about a glamorous young woman who appears in the law office with information that may resolve the case in Albert Gregor's favor. She knows where the will is to be found. The woman is Emilia Marty, a famous singer. I'm not sure I want to explain the entire plot. Emilia was born Elina Makropulos in 1585 in Greece. At 15 her father gave her a potion that made her virtually immortal. She has lived in various countries under various assumed names, including Ellian MacGregor, making her Albert Gregor's ancestor. This is also the reason she knows so much. The opera has an astounding role for a dramatic soprano. I'm sure our Emilia, Nadja Michael, could hold her own against any of the others. It is staged in a very physical way. She climbs on the furniture and shows off her swimmer's physique. I have previously seen her here as Salome and live in HD from the Met in Bluebeard's Castle. She brings to the stage a huge voice and thrilling intensity. She is what you would want here. Over the course of the opera Emilia realizes that she has lost her lust for living and explains to the other characters that it is death that gives life its meaning. She allows herself to die. The opera ends well, except we never hear how the case came out. Gradually this has become my favorite version of this aria. Anja's version is the inner Tosca, the real woman who has lived for art and love and does not understand why the Madonna has turned against her. Armiliato is with her in every note. The film I posted before is gone. This one is more recent. This performance from the Paris Opera of Eliogabalo by Cavalli in Italian with French subtitles is rather more cold than even I can tolerate. I tried watching it without knowing anything, and this didn't work out for me. For an excellent discussion of this production see The Idle Woman. It was composed for a Venetian carnival performance in 1668 which did not take place. Many speculate why this would happen. Cavalli was the most important Venetian opera composer but was coming to the end of his life. It may also have been censors. One writer suggests that it may have been too serious for carnival. It's first performance was in 1999, then René Jacobs revived it in 2004, and it's played in several locations since. A description of the plot can be found here. View the stream here. The music is clearly still in the style of the late operas of the great Monteverdi. I am no longer "cold" in this aspect of the performance and enjoy it very much. Emperor Eliogabalo has returned to Rome. A rebellion by the Praetorian Guard has been put down. The plot concerns itself primarily with his sexual interests. He's no longer interested in Eretea and needs new women to harass. There are frequent appearances of young men wearing only loin cloths, such as our Amor above. I find the arias, especially by Nadine Sierra and Paul Groves, particularly beautiful. I've been in the Senate and there are no halls. Women in tall hats are entering. Eliogabalo has replaced the male Senate with an all female one. Eliogabalo himself is dressed as a woman and sings their praises. 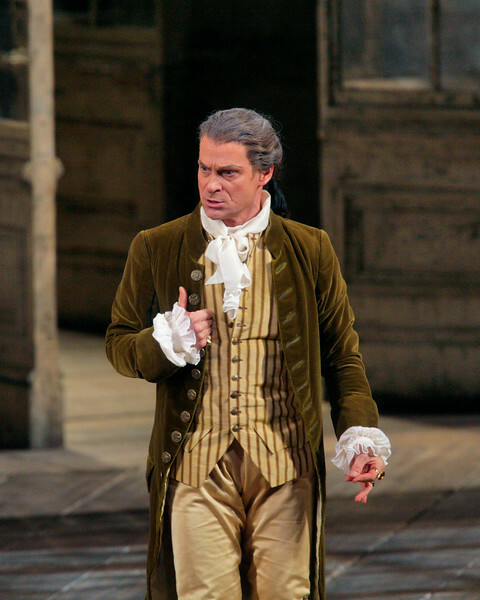 We can say already that this opera is about cross-dressing, mostly men dressing as women, such as Lenia who is a tenor. The women cover their faces and are told to embrace one another. The one who guesses who is touching them wins. Atilia guesses and becomes a proconsul. Flavia cannot guess when it is Eliogabalo and goes off embarrassed. If you are tired of the impossible to stage da capo arias of Neapolitan opera, this may be just what you want. This is from the era when the composers wrote their own recitative and regarded it as an important part of the work. This opera is strangely relevant. Who would have thought our own country would become something like this. Nadine suddenly sings a very high note. Fun. The most shocking thing about this production is how not shocking it is. Obviously Eliogabalo is a scandal. How can such a dark and low key production express this scandal? Eliogabalo prepares a banquet with two prominent pitchers. Zotico and Lenia taint the pitchers--one is sleeping potion and the other poison. Nerbulone drinks the sleeping potion. Large black owls descend on the table, and the banquet is cancelled. The owls dance. Franco Fagioli is enjoying a peak in his career. His countertenor is very robust. I am a fan of Nadine Sierra and am happy to see her performance here. Eliogabalo is the only character who gets interesting costumes. He sticks his arms and feet into a bath and they come out covered in gold. He gets in. One of the people dressed in a loin cloth appears to be a girl. He thinks about Flavia while everyone else thinks about killing him. Eventually they succeed. One would choose an opera about this particular Emperor for the debauchery, surely. It was probably rejected for the seriousness. I personally would have liked a less serious production. The music is glorious but just a little long. Everyone is at the games, but Eliogabalo does not arrive. Then it is reported that he is dead. Flavia brings in his head and explains that the guards killed him when he broke into her room. Alessandro becomes emperor, marries Flavia and everyone lives happily ever after. This music is very beautiful, but I imagine the Venetians wanted more bang for their buck. I seek out oddities because I have quite a lot of intellectual curiosity. In the process of writing my music history book I crammed a lot of knowledge into my brain. I cannot resist the opportunity to experience something that I know only from study, such as Les Indes Galantes, Béatrice et Bénédict or Donnerstag aus Licht. What I find is that there is with music no wasted time. I don't always like what I experience, but I always feel that my mind is wider, fuller, more ready for new experiences. I now feel that I have given to Stockhausen all that he deserves. I might watch the helicopter string quartet again, but that's probably enough. But from Rameau I might want more. If he were performed with the same musical lightness of touch, I would not wish to miss it. Previous to blogging I had never made it to the end of Tristan. I watched several famous films and loved only Nilsson and Vickers, though only for the singing. I cannot speak for you, but I can encourage everyone to seek joy in unexpected places. Offer your soul the right to expansion. Find that something you never thought of watching will unexpectedly find its voice. That Tristan will tell its meaning as never before. Perhaps here too it is the lightness of touch that speaks to me. Perhaps the greatest success comes from allowing the music to speak for itself instead of trying so hard to impress us. Things I liked about Wagner's Tristan und Isolde live in HD today. I liked the outstanding conducting by Simon Rattle. I very much enjoyed listening to him talk about today's performance. I liked Debbie Voigt interviewing Nina Stemme, one Isolde to another. I liked it when Nina said playing a Valkyrie could make you more of a Valkyrie. I liked that this was the first time I thought while listening to the performance that only the Metropolitan Opera orchestra could play this piece this much more beautifully than anyone else. I liked Nina Stemme and Stuart Skelton putting their own personal stamps on this opera. So much emotion, so much emotional singing and acting. I liked René Pape, the best Wagner baritone around. I liked so much love. So much love by everyone on the stage, in the pit, behind the stage. So much love. I cried. 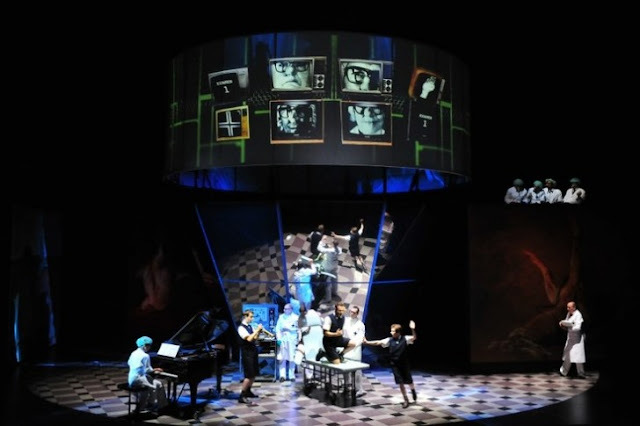 I liked the production which took images from the libretto to form the basis for its visual effects. I liked talk about the anniversary performance of Antony and Cleopatra by Samuel Barber. It was a new house with all the fancy new equipment. Franco Zeffirelli used every new gadget in his production, and most of them failed. Rosalind Elias and Justino Díaz were interviewed from the original cast. And it's not true that the other performances were cancelled. I liked Richard Wagner's libretto which I could primarily understand in Nina's singing. This was a surprise. This production might just work better without the surtitles. In the house this would be possible. For me the text was too bright against the dark background. I liked seeing the love in their faces. I haven't thought of anything I didn't like except Isolde smoking. I feel recovered from Donnerstag. 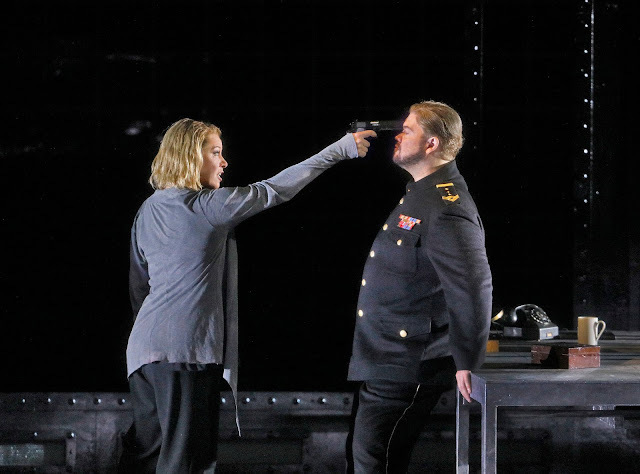 In case I haven't been clear enough I want to say that I found this Tristan und Isolde to be deeply satisfying on every level. I felt that the story penetrated my consciousness as never before, that the orchestra playing was profoundly beautiful and the singing actors the best ever. Of course the production is Regietheater. We are moved to an abstraction of today with military uniforms and modern dresses. If there were difficulties, they were to be found in the projections, sometimes symbolic, sometimes personal. A boy is seen and a thin man in a white uniform who cannot be King Marke. I think this comes from the Act III solo by Tristan where he describes how he knows the sad tune he is hearing. His mother died when he was born and his father when he was still a child. So the projections picture the young Tristan and his father who must also have been a high ranking military man. The ghost child is also Tristan. I thought I was seeing a solar eclipse in the black circle surrounded by light. And some kind of nautical device in the other circle. I always feel free to ignore symbolism. A full length, fully realized performance of Stockhausen's Donnerstag aus Licht (Thursday from Light) has been presented in Basel and live streamed through sonostream.tv. If you hurry, you can see it for yourself. It is important to notice that this work, composed in 1978-80, came very quickly after Philip Glass's Einstein on the Beach (1976). My son assures me there is a full 7 day cycle, but we find one day sufficient. The two operas, Donnerstag and Einstein, share the feature of having instrumentalists appear on stage as characters. I notice from reading Wikipedia that the staging presented here does not precisely conform to the description of the action in Wikipedia. Then I notice that the Stockhausen Foundation for Music has "grave misgivings" about the staging presented here. With Einstein the opera and the staging are considered one. Wikipedia also reassures us that "no clear meaning is apparent." Thank you Renée Fleming, soprano (Marschallin) Erin Morley, soprano (Sophie) Susan Graham, mezzo-soprano (Octavian) Franz Hawlata, bass (Baron Ochs) and Andris Nelsons and WCRB. There can never be too much Rosenkavalier.